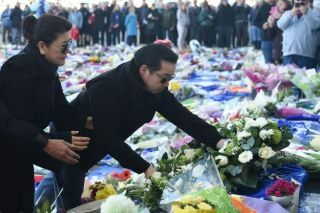 Photos have emerged today of family members of Vichai Srivaddhanaprabha visiting Leicester City’s King Power Stadium to pay tribute to the late Foxes owner. The 60-year-old was a hugely popular owner of Leicester, saving the club from administration in 2010 and guiding them back to the Premier League. Remarkably, Leicester even managed to win the title in 2015/16 in a feat that will go down in history as one of the biggest shocks in sporting history. Srivaddhanaprabha’s contribution to that miracle achievement is clear from the tributes that have flooded in from fans and the people of Leicester in general. See the photos below as members of his family arrive to join the other mourners at the club, with huge amounts of flowers and messages left by the stadium. Srivaddhanaprabha and four others were tragically killed on Saturday evening after his helicopter crashed shortly after leaving the King Power after the game against West Ham. Leicester’s next game against Southampton in the Carabao Cup has been postponed out of respect, and to allow players and staff at the club to come to terms with this deeply sad news.